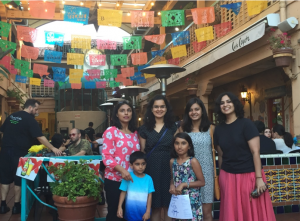 WINStep CEO and and Executive Director Naveeda Qadir were fortunate to be able to spend some quality time with the University of San Diego Khorana Bose Alumni Chapter this past summer. Dr. Ansari squeezed in time to attend Khorana Alum Annie Rathore’s PhD defense. Annie was a 2013 Khorana Scholar and returned to Scripps for her PhD, and is now headed to the Big Apple, New York City, to transition out of the long trek of obtaining a doctoral degree and to start pursue a careerworking as a Life Science Consultant at Deloitte Management Consulting advising top biopharmaceutical companies on development of their R&D strategies. 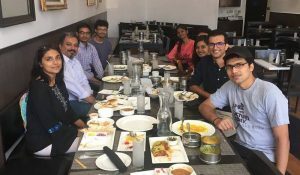 Dr. Ansari also introduced the UCSD Alumni Chapter to Dr. Suresh Subramani, who recently stepped down from his position as UCSD Vice Chancellor to accept his role as the Global Head of the Tata Institute for Genetics and Society based at UCSD. Dr. Subramani encouraged the alumni to follow their passions, and whether that happens in the U.S. or India would not be relevant to their ability to contribute significantly to both Indian and U.S. society. The WINStep team enjoyed meeting the Alumni over a lunch as well dinner in historic Old Town, San Diego. We look forward to seeing all of you again in the near future! WINStep management looks forward to meeting with former Scholars whether in U.S. or India. Be on the lookout for a stop over by WINStep in your area!